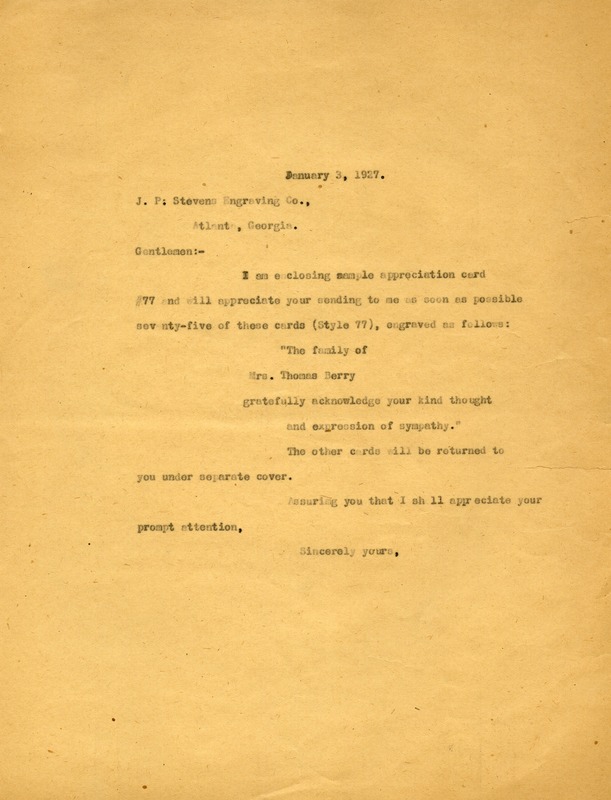 Miss Berry sends the engraving company a sample appreciation card and requests 75 of them engraved with the message "The family of Mrs. Thomas Berry gratefully acknowledge your kind thought and expression of sympathy." She says the other cards will be returned under separate cover. J. P. Stevens Engraving Co.
Martha Berry, “Letter to J. P. Stevens Engraving Co. from Martha Berry.” Martha Berry Digital Archive. Eds. Schlitz, Stephanie A., Chelsea Risley, et al. Mount Berry: Berry College, 2012. accessed April 20, 2019, https://mbda.berry.edu/items/show/5844.